Please forgive the blogging delay--trips away--and another kind of trip--resulting in a broken upper arm have kept me from the computer. Back in the saddle again--but will be hunt and peck left handed on the computer for awhile. This week the news is full of the engagement of William and Kate--and all sorts of royal family news. Many stories focus on the engagement ring--that fabulous sapphire ring that many of us remember on Diana's finger in the early 1980s. That beautiful young girl in that beautiful ring.--seems like forever ago. In 1981, I had the incredible fortune to attend the University of London for a graduate semester. While I was there--November I think----Princess Diana and Prince Charles announced that they were expecting a baby. Newspapers are hawked on every street corner in London--and that day all the paper stands had the familiar throw away promo sheet poster that screamed "Baby for Diana" 3 Page Special Evening Standard. Riding back to my flat that night from classes at Russell Square--the Underground stopped as usual at an above ground station at South Kensington. While alighting from the Tube (in England you do not get off a train--you alight!) I was watching as a man dashed by and jumped on the train a split second before the train roared off again. He dropped something. A newsprinty thing folded into quarters. I knew what it was before I even picked it up. 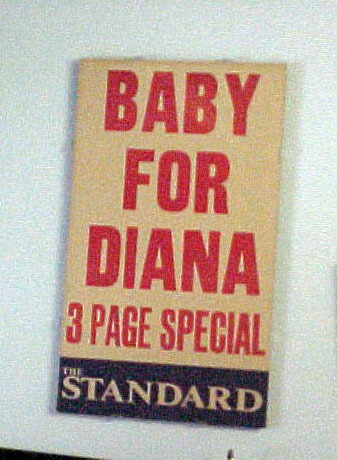 One of those fabulous Baby For Diana posters. Talk about ephemera--I imagine most were tossed out by paper vendors--but a few must have been saved. And I have one. I brought it back to the states--and it has been framed and has lived where I have lived since 1981. The color remains good--in spite of being printed on low quality newsprint. I know that it would have quite a price if I decided to sell it. But no way--mine it remains. That baby is now 28 years old and engaged to be married. Antiques aren't antiques at 28 years of age--but they can be priceless just the same.